*This post contains affiliate links. I may earn a commissions on recommendations at no cost to you. There are natural downsides to clutter no matter who you are, but there are especially some serious downsides for kids. Naturally, a major area that has been researched when it comes to kid clutter is the area of toys. Here are some of the findings of kids who have excess toy clutter. When it comes to clutter with kids, personally, I think there are a few upsides. I think back to when I was a kid at my grandma’s house. The entire basement was my play area. I set up Barbie houses, stores and vacation spots all over the basement using tables, chairs, or cardboard boxes as the buildings. Naturally, this creativity left a huge mess. The same goes for my kids. They love building things out of our recycling. Yeah, I let them rifle through the trash. They build things like racecars, time machines, boats, robots…you name it they have hot glued it together. Do I love having actual garbage glued together in my dining room? Not particularly. But I strongly believe allowing kids to make messes and get creative is the best kind of clutter and helps them really experience hands-on learning. You might not be able to stash away a massive racecar made out of boxes and Pringles tops, but I am a big believer in hiding as much clutter as you can. We have DVDs stashed in drawers under our TV and blankets and games hidden in a bench. Even in our kitchen, we put things like the toaster and blender in the cupboards to avoid unnecessary clutter on our counters. If you are working toward being clutter free with kids, it often means finding creative ways to hide their toys, diapers, books, games and other supplies. If you have little ones at home in diapers, I suggest setting up a small diaper station in a basket in the main area of your home. This will prevent you not only from having to run all over the house to get what you need but also will prevent you from tossing diapers or wipes onto the arm of the couch. Having a designated “hiding spot” for unsightly items like this is a great way to instantly make your home appear a little more clutter-free while still making sure you are fully equipped to be the parent you need to be. If you have kids who have toys in their rooms, it can be tricky finding a way to keep them off the floor and out of sight. Here is some super great organization ideas for kid’s toys that will help you keep things out of sight and out of mind. If you don’t want toys, shoes, and games laying all over your living room or entryway, then it’s your right to say so. 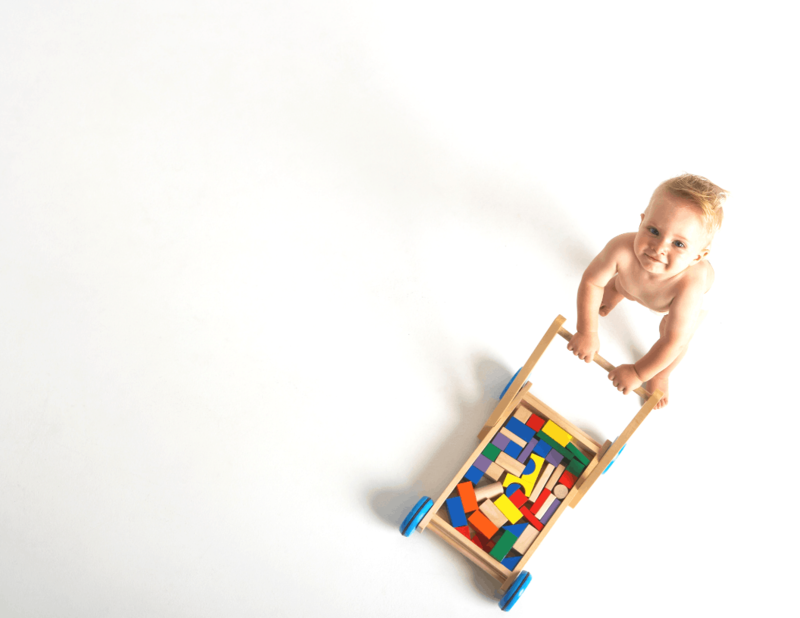 Just like your kids may have a toy room or a designated play area, you can easily make certain rooms off limits. As soon as a single off-limits item hits the floor in a designated no clutter zone, treat that thing like hazardous waste and get it outta there fast. Paperwork. The dreaded clutter of all parents. Am I right? Trying to stay clutter free with kids is almost impossible just because of the paperwork from school functions, field trips, homework and sports. An awesome long-term solution to paper clutter is to create a paperless home altogether. This might mean canceling subscriptions, getting yourself off promotional mailers and/or creating a digital filing system for your papers. There is an awesome eBook and tutorial called The Paperless Home that shows you exactly how to begin a paperless system in your home. There is really no denying that the world is going digital, and The Paperless Home is most definitely the next step in keeping all of your important papers and documents in one place for you to easily access. Plus, it will eliminate paper clutter like crazy! Learn more about going paperless. Of course, creating a totally clutter-free digital filing system takes time and there is a learning curve involved. So what can you do in the meantime to fight back at that paper clutter? The best way to avoid paper clutter taking over your counters, couches, coffee tables and more is to set up a designated important paper area in your home. As soon as you bring the mail in, quickly recycle any promotional flyers or junk mail, open anything that needs immediate attention, and put the rest into an easy access bin. Ours is in our pantry. In order to avoid having clutter pile up in your home (even if you don’t have kids) make sure you do small 30 second or less tasks right away. It might sound silly but so many people put these simple tasks off and end up creating a bigger mess in their homes and then have to take considerable amounts of time out of their week to clean up after themselves. When the original task would have only taken a few seconds. Making sure you are running a home where these quick tasks are done immediately is one of the best ways to keep a house clutter free with kids. I still remember as soon as my kids were old enough to be done with baby swings and exersaucers, I couldn’t wait to get those big, clunky things out of my house for good. When you know you are done having kids, be quick to donate or give away items that you know your children will no longer need, play with, or fit into. A great place for donating toys like Legos, DVDs and old electronics is Decluttr. You can send everything off in one box and they will pay you for your donation! For clothing, Bagsy.com is a great place to sell gently used children’s clothing online. If there are a few sentimental items you really love, store them in a keepsake box and then be quick about getting the rest out of your house. A lot of times people hang onto baby clothes for so long with the intention of giving them to someone else that they never actually get used and eventually go out of style. Don’t be that person. This very well could be my top recommendation. No matter what age your kids are, I strongly believe you can start including them in the cleaning, donating, and decluttering process. Take the time to talk to them about how important it is to care for our homes and not let them get over-run with clutter. When they are old enough, encourage them to start doing chores. My kids were “helping” as soon as they could walk. Whenever they saw me dusting or vacuuming they always wanted to help. Did their help really make a difference? No. But it encouraged them to be a part of the process of caring for our home. To this day my kiddos are very involved in maintaining our home and I can only imagine they will carry these lessons into adulthood. The month before Christmas or a birthday, I always bust out some donation boxes for the kids to put toys into. I do the same before summer, winter or spring when it comes to their wardrobes. We will take the time to go through clothes that no longer fit and toys that are no longer played with. The unused items go into donation boxes in order to make room for the new supplies that they need. The best way to avoid a problem is to avoid it happening in the first place, right? Well, the same goes for creating a clutter-free home with kids. If you know grandma and grandpa are really planning to go all out with gifts for Christmas, maybe for your gift, you could invest in passes to the local zoo. Spending time together inside or outside of the home is far more beneficial to your kids than any toys could ever be. Our personal favorite gifts to give are experience gifts. These gifts help round out our kids and encourage us to spend time together as a family. At the end of the day remember while being clutter free with kids might sound amazing, it isn’t always possible. If you are living in your home, if you have children there and they are playing and making memories…there will always be a certain level of clutter. Often times I think the obsessive need of parents to avoid clutter can often do more damage than good. So, take a deep breath, put the practices in place that you can and let go of the crazy chaotic times you can’t control.